I am the oldest of four siblings, with two younger sisters and a younger brother. I am eternally thankful for my family and the bond I share with my siblings. I am also immensely thankful that although I currently live about six hours away from my hometown, I am only minutes away from my two sisters. The circumstances, which have led us all to live within 5 miles of each other, six hours from our hometown, couldn’t have been better planned if we’d tried. Growing up, surrounded by a large, loving network of aunts, uncles, and innumerable cousins, my sisters and I always appreciated the value of those family bonds. We knew, without a doubt, that when the time came to begin families of our own, we wanted to be near each other; to be able to provide our own families with that same close, loving family we experienced in our youth. We are so fortunate that the twists and turns of our lives have led us to where we are today. Now we just need to figure out how to get our brother up here too! I have so many wonderful memories of spending time with my sisters in our childhood; running around the yard, choreographing dances to our favorite Madonna or Traveling Wilburys albums, and riding bikes along the boardwalk near our home. Recently, I was also reminded of one of our favorite past times, which involved chasing our youngest sister around the yard on the pretext that she had a caterpillar in her hair or while yelling, “Your epidermis is showing!” Siblings can be ruthless. During one year, when my parents must have learned that too much TV is detrimental to developing young minds and decided to limit our TV time to one hour a day, my sisters and I relied on each other to tag-team movies. I don’t think I ever got to see The Goonies from start to finish until I was an adult. That pirate ship makes a lot more sense now. We’d spend winter days inside, trading Barbie clothes and working on our dance moves. And during warm summer days, we’d wander in the woods surrounding our home and indulge on 5-gallon tubs of ice cream…our secret snack in our private, wooded hiding place. Now, in our adulthood, our activities are not that much different from our youth. We still play games in the yard, run together, and engage in the occasional spontaneous dance party. We still taunt each other and enjoy movies together. And we still indulge in delicious treats during sisters nights, which usually involve no more than relaxing in one of our homes, chatting and laughing over good food and beverages. 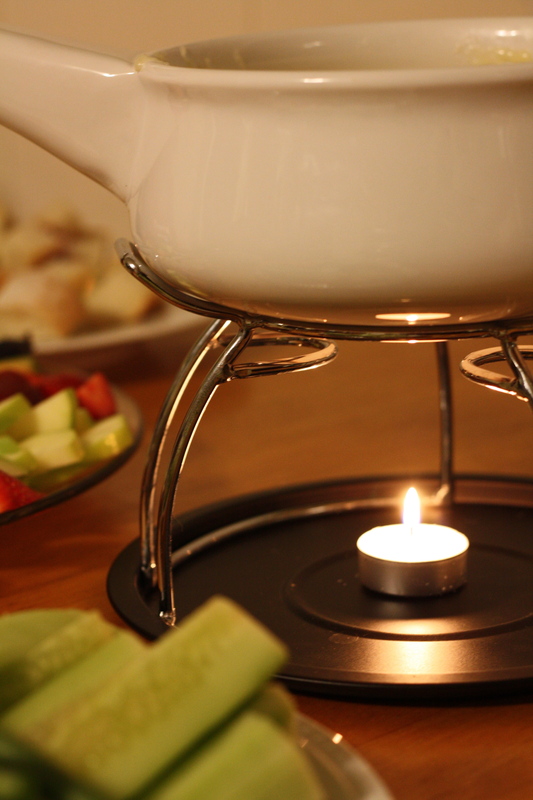 During our most recent sisters night, we enjoyed our conversation huddled around a warm pot of three cheese fondue. 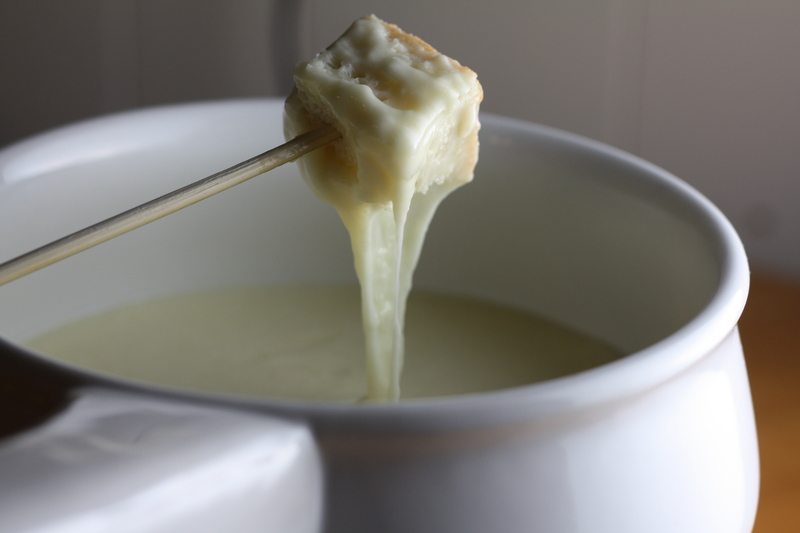 This super simple fondue combines three of my very favorite cheeses; gruyere, fontina, and brie. A bit of white wine and cornstarch help bind the melty mixture. A fondue pot is certainly useful for serving fondue, but if you can devise another way to keep the cheesy mixture warm, you can do without the special fondue pot. The key is the keep the mixture gently warmed to prevent the cheese from forming a gloppy mess! Then, simply dip and enjoy…preferably with a few close friends or family members by your side! Toss the shredded gruyere and fontina with the cornstarch. Set aside. In a pan or stovetop-safe fondue pot, bring the white wine to a simmer. Turn down the heat to low and add the gruyere and fontina mixture. Stir until completely melted. Add the brie cheese and stir until melted. If necessary, transfer the mixture to your fondue pot. Keep warm over a lit tealight candle. 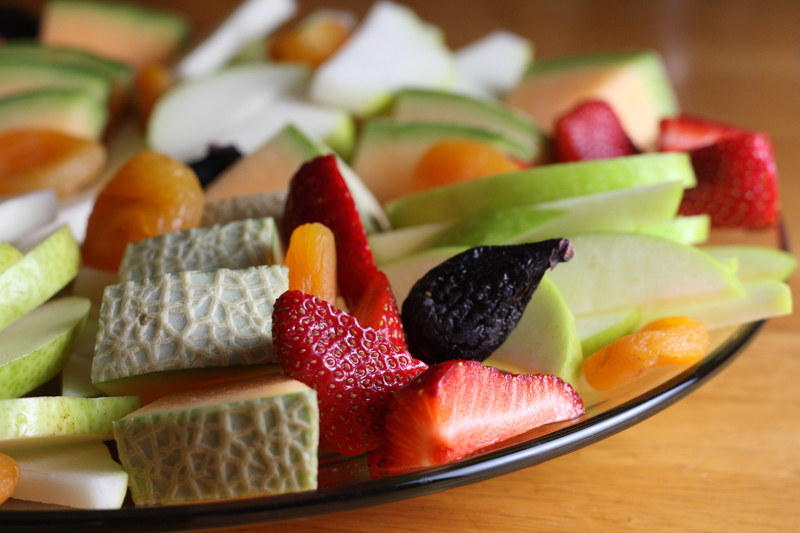 Serve with an assortment of fruits, vegetables, and bread. Posted in Cheese, Food, Fruit, Recipes, Side Dishes, Vegetable and tagged cheese, Cooking, family, Food, hors d'oeuvres, life, love, Recipes. Bookmark the permalink.